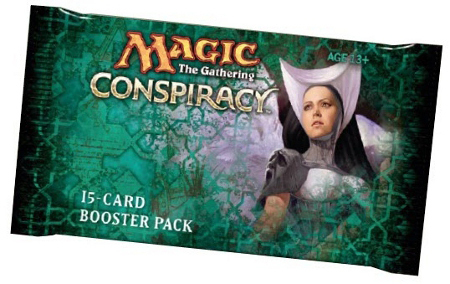 The Conspiracy booster pack contains 15 cards each. The first-ever multiplayer-focused booster set has new Magic cards with new mechanics that enhance multiplayer play. Returning favorites from throughout Magic's history round out the set and cultivate an environment of deception and treachery. The Magic: The Gathering–Conspiracy set is designed to be drafted with six to eight players who then split into groups of three or four players for free-for-all multiplayer games. Magic: The Gathering—Conspiracy will not be released on Magic Online, but certain cards from the set will be made available in Vintage Masters. There are sixty-five new cards in Conspiracy. Fifty-two of the new cards will be legal in Legacy and Vintage; thirteen cards will not.